This talk highlights two collaborative projects undertaken by the Chemical Engineering Subject Librarian, the University of Florida Digital Library Center (DLC), and the Chemical Engineering Department. In both cases, the Department reached out to the Subject Librarian, who identified the resources of the DLC as being able to meet the need for access and preservation for the collections. The first project created an online archive for an international conference hosted at the University for which proceedings were only distributed digitally to attendees. The Subject Librarian disambiguated author-provided keyword metadata, resulting in a more cohesive search experience for users. 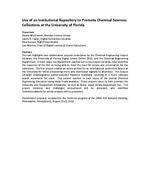 The second resulted in back issues of the journal Chemical Engineering Education being made freely available. These projects serve to both promote the University and Department scholarship, as well as foster closer library-department ties. The project timelines and challenges encountered will be discussed, and workflow recommendations for similar projects will be presented. Presentation proposal, accepted for the Technical program of the 244th ACS National Meeting; Philadelphia, Pennsylvania, August 19-23, 2012. Use of an Institutional Repository to Promote Chemical Sciences Collections at the University of Florida Presenters Donna Wrublewski, Marston Science Library Laurie N. Taylor, Digital Humanities Librarian Dina Benson, IR@UF Coordinator Lois Widmer, Chair of Digital Services & Shared Collections Abstract: This talk highlights two collaborative projects undertaken by the Chemical Engineering Subject Librarian, the University of Florida Digital Library Center (DLC), and the Chemical Engineering Department. In both cases, the Department reached out to the Subject Librarian, who identified the resources of the DLC as being able to meet the need for access and preservation for the collections. The first project created an online archive for an international conference hosted at the University for which proceedings were only distributed digitally to attendees. The Subject Librarian disambiguated author provided keyword metadata, resulting in a more cohesive search experience for users. The second resulted in back issues of the journal Chemical Engineering Education being made freely available. These projects serve to both promote the University and Department scholarship, as well as foster closer library department ties. The project timelines and challenges encountered will be discussed, and workflow recommendations for similar projects will be presented. Presentation proposal, accepted for the Technical program of the 244th ACS National Meeting; Philadelphia, Pennsylvania, August 19 23, 2012.